Britain must work alongside Russia and Iran in seeking an end to the Syrian conflict, UK Foreign Secretary Philip Hammond has said in Tehran, where he has met with President Hassan Rouhani and re-opened the UK’s Embassy. 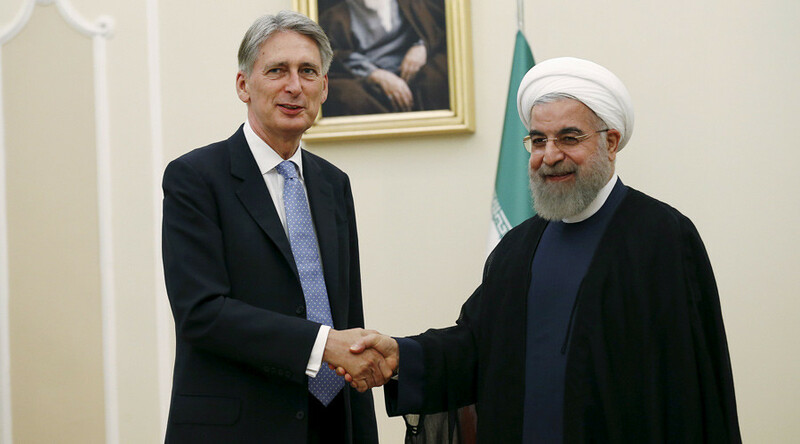 Speaking earlier on Monday morning, Hammond said the UK should “tread carefully” in its new relations with Iran. He added that despite a “deep legacy of distrust” Iran is “too important a player” in the Middle East to leave isolated. The Foreign Secretary reopened the British Embassy in Tehran on Sunday, which still bears the graffiti “Down with the English” from when it was over-run by a protestors in 2011. The Foreign Secretary went on to say he expected Iran to be an autocratic, deeply religious society before visiting the country. “But what I’ve seen a perfectly normal, bustling, dynamic, entrepreneurial, thrusting, middle-income developing world city that has clearly enormous potential; not a regimented, disciplined society under the thumb of the authority,” he said. Speaking to BBC Radio 4 earlier on Monday morning, Hammond acknowledged the “difficult history” of Iran-UK relations, but expressed optimism for new diplomatic relations. “Yes, we should tread carefully. There is a deep legacy of distrust on both sides, and we have major areas where we have very substantial policy differences, but that doesn’t mean we shouldn’t be talking. “And as we work more closely together in those areas we will find it easier to have a sensible dialogue about the many areas on which we disagree, including human rights in Iran,” he added. Hammond re-opened the British Embassy in Tehran on Sunday marking the official re-starting of diplomatic relations after UK diplomats were expelled from the country four years ago. Following the expulsion, which came in response to Britain’s support for sanctions against Iran, the UK Embassy was stormed by protestors and covered with graffiti. Britain has reportedly offered to pay for the restoration of the Victorian building, however at the time of opening there remained several examples of vandalism, including the words “Down with the English” scrawled above a portrait of the Queen. Hammond met with Iranian President Rouhani after reopening the embassy – which will be headed by a charge d’affaires until an agreement on upgrading the post to ambassador status is reached. Iran’s Foreign Secretary Mohammad Javad Zarif said the two countries were in “general agreement” to fight sectarianism and drug wars in the region. “I welcome Mr. Hammond for his visit to Iran and hope that national and personal ties would help a common understanding and improved cooperation to the interest of both nations and the fight against extremism in the region,” he said in a press statement. Iran and six leading world powers – China, France, Germany, Russia, the UK and US – signed a landmark deal for ending international sanctions against Tehran in exchange for putting restrictions on its controversial nuclear program in July. Britain has been quick to re-establish diplomatic relations with Iran despite long established anti-UK sentiment there, which is largely due to the UK’s history of intervention in the region. Britain has orchestrated several coups d’etat in Iran over the past century, beginning with the 1921 Persian coup which saw the installation of Reza Pahlavi as Shah. During World War II, the UK and Soviet Union invaded Iran and exiled Reza Shah in order to secure oil supplies for the Allied war effort against Nazi Germany. Reza’s son Mohammad Reza Pahlavi was installed as the new shah in 1941. Britain and the US also organized the 1953 overthrow of Iran’s democratically-elected Prime Minister Mohammad Mosaddegh because of his plan to nationalize the Anglo-Iranian Oil Company, now known as BP. Mohammad Reza assumed greater power as a result of the coup and his authoritarian governance set the conditions for the Islamic Revolution of 1979, which forced him into exile.